Team: A.L.P.H.A. : Six battle-hardened alphas with one goal - to save any omega in peril. David Dempsey, the younger omega brother of Team ALPHA’s crazy twin duo, has gone missing after a camping trip with some human friends. He'd only planned to celebrate his upcoming college graduation - but somehow ended up taken captive by a sketchy group after catching them in a criminal act when he wandered too far away from his group. Simon "Boomer" Chiarelli is a laid-back alpha with a love for things of an incendiary nature - but nothing has ever been as explosive as the connection he feels when he catches the scent of his mate. But why, of all the shifters on the planet, does his mate have to be related to the twins? Can Team ALPHA stay united when tension breaks out among their own? Between dodging Zeke’s famous knife and Ezra’s penchant for hitting things - while still trying to connect with his new mate - Boomer’s life is about to blow-up in a whole new way. This is the third book in our top-selling series, but can definitely be listened to as a stand-alone novel. You can expect to find naughty, knotty scenes of steamy passion, along with a lot of potty-mouth language and some violence. No humans were harmed in the writing of this book - unless they kinda deserved it. HEA definitely included, intended for 18+ listeners only. Seriously, would you expect anything less from Susi Hawke and Crista Crown? This is the third book in The Team A.L.P.H.A. Series. A great book the writing was good. The plot was entertaining and it was steady throughout the book. I found the story and characters wonderful. The characters were developed and thought out. Boomer and David are the MC’s of this book and mates. There was humor, wolves, shifters, Brotherhood (cult type bad guys), food, wolf’s bane, friends and family, camping and so much more in this book. I didn’t care for the narrator’s voice (I’m picky), but they did a great job narrating. It wasn’t monotone and there were different voices. I can recommend this book as a good read/listen. I voluntarily read an advance copy of this book for an honest review. A great addition to the series. I really enjoyed the mc's and their connection. The story moves along at a good pace. There is lots of action and suspense, Humor as always plays a part in this story. Colin Darcy does a great job of giving voice to these characters. He adds so much enjoyment to listening to Struck! Loved this one from Susi Hawke and Crista Crown! Colin Darcy is such a good narrator and did a lovely job at bringing these characters to life! Looking forward to more in this series! Little brothers are great but not when they're the fated mate of your friend and coworker. I laughed so much in this book. Poor Boomer got picked on, a lot! Love this series! Colin Darcy does a fantastic job of bringing this story to life. He gives each character their own voice making them easily identifiable and a more immersive listening experience. The story is entertaining with interesting characters and an intriguing storyline. I’m eager to listen to the other books in this series. The story was good on the insta-love/romance piece and dealing with the fallout with family and friends over the sudden mating; however, I wanted more of the story of the terrorist group and more action outside the bedroom. The narration is very good. The different characters were easily distinguished, and the delivery was smooth and even. Another great story in the Team A.L.P.H.A. universe! I have read this whole series and it is wonderful and I knew the audible version of Boomer and David's story would be awesome, I wasn't wrong :) Boomer and David are perfect for each other even if they weren't fated mates. Boomer is hilarious in the way that he handles the animosity coming from David's brothers and I love the fact that David stands up to his brothers in Boomer's defense. All these two can hope for is that when the twins find their mates they are able to repay some of the troubles they give them (I won't give any secrets away since I've already read their stories). The background story that started in the beginning of the series is still ongoing but this does not end on a cliffhanger. It's interesting to see how Susi Hawke and Crista Crown build the story throughout the series and they definitely don't disappoint on the mates stories! I'm looking forward to hearing the next in this series. Colin Darcy did an awesome job with the narration as always, it was easy to differentiate between the voices and fun to listen to, I laughed quit a bit during this installation! This is a great addition to the series. Boomer and David are great together and I really like their dynamic. Love that twist that Boomer's fated mate happens to be the little brother of Zeke and Ezra, that definitely makes for some awesome drama. I really enjoyed the progression of their relationship and I'm looking forward to the next one in the series. I can't wait until Zeke and Ezra find their mates! The narrator did a great interpretation of the characters and I enjoyed his telling of the story. I was given this free review copy audiobook at my request and have voluntarily left this review. A fun fated mates story. Alpha/Omega, fated mates and an unexpected heat all escalate the relationships progress. I really liked David and Boomer and how they treated each other and how honest they were. I loved the extended families and their interactions. The writer spent a lot of the story focused on the animosity of David's brothers toward the mating and that got a little old for me. All was resolved with the family dynamics by the end of the story. i am not a fan of the narration, the accents were weird to me. loved it a lot, the narrative was brilliant will be getting the next one for sure. I love this series and I love Colin Daddy's narraton of the book. cannot wait for more books in this series! This is the third book in the Team A.L.P.H.A. series by Susi Hawke & Crista Crown and is narrated by Colin Darcy who does a very good job of giving Boomer, David, the twins, Boss Boy, Jonah, Levi, BossMan, Papa P, Mama C and all the other supporting character their own voices to help bring the story to life. The twins' worst nightmare comes true when their omega "baby" brother David disappears just before his college graduation when on a celebratory camping trip with his friends. Team ALPHA jumps right into action and tracks David's last known movements in order to figure out what has befallen him. I find the antics of the team highly hilarious and often start giggling to let out a random snort the listening to the tale. The twins try to do their worst in this story, especially once Boomer meets David and finds his fated mate! I feel sorry for Boomer having to put up with his two rough and crude team mates as brothers-in-law, but David turns into quite a fierce protector! I always look forward to these audio releases, and this latest instalment did not disappoint. 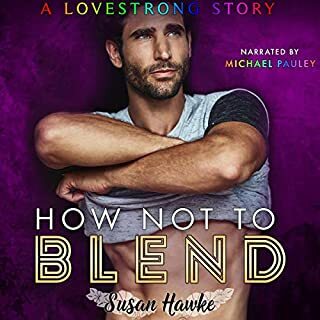 I highly recommend that you read/listen for yourself if you're a fan of Susi Hawke or are looking for something fun and highly entertaining. Go Team A.L.P.H.A., go! I enjoyed listening to the story, but it felt a little incomplete, rushed? Boomer rescues David, his fated mate. They mate and that caused some strife with other team members. Meanwhile, the team is still trying to get intel on the group that snatched David - that didn't really progress. Then David is pregnant, somehow we go from pregnant to babysitting - I felt I missed something. The narration was good, kept me engaged. David and Boomer is fantastic to listen to, the book to read is amazing but this Audible just brings it to life, their chemistry is off the charts, Colin Darcy brought this to life it is better then the book because of his take on the MCs and the story as well. Some parts had me laughing out loud as always with this author books she always has humour in them, definitely recommended. I jumped into this series with this book/ narrative. I enjoyed the story, the interaction with the other cast of characters, the tension within the team, although I might want to beat up on David’s brothers a bit! I like that there is an underlying storyline, although being book 3 I’ve missed the background and do feel it’s a necessity for full understanding. So I have some back listening to do. I do like Colin Darcy’s narration performances and he does a beautiful job with this one too. So in conclusion Good romance, great action, great narration. Really best read or listened to in order to get best experience.